Money management rules are an obvious part of every good stock trading strategy. Management of the risk involved in every single trade or investing position has similar importance like stock picking know how or trade management rules. This is quite neglected part of traders’ or investors’ plan. Remember: You cannot make money without these rules. My tip: If you are a beginner on the market, start with a small risk. Use 0.4% or 0.5% of the total account value. And as your confidence grows and journal of your trades reports your success, increase it in you cash management rules. The definition of maximal risk value for every single position could vary a little bit. The best traders and fund managers recommend to use values between 0.5% to 2% of the total account size. The account size is $100,000 USD. The maximum risk per position is 1%. It means that you can lose $1000 USD on every trade. If distance between your entry and stop-loss level is $1 USD, then you know that you can open position with 1000 shares. Simply calculated by (absolute risk)/ (point of distance between entry and stop-loss level). Should you open position with 1000 shares? No! You must check other money management rules and combine the results. It isn’t easy to manage trades by moving stop or taking profits manually if you have a lot of trades and only two hands! You must be able to manage trades manually in case of any strong move on the markets. Even if you are not day trader but you are swing trader, it can happen. You must limit the maximum number of opened positions. The absolute maximum for a single person is eight open positions at once. Don’t surpass this hard limit. Five or six open trades at once as a maximum is an appropriate limit for every trader. Your broker account size is $100,000 USD. You decided to have max. five open positions at once. Your broker provides you with a 2:1 overnight margin. That means you can use $40,000 USD for one trade. How was it calculated? 100,000 x 2/5 = $40,000. So when you plan to buy XYZ stock with a stock price of $20 USD, this rule tells you that you can buy max. 2000 shares. 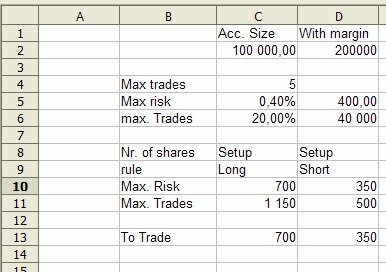 Combine it with the number of shares from the previous rule and use the LOWER value for your trade setup. Never, ever try to have the risk reward ratio less then 2.5 to 1. This rule is crucial in your statistics, especially if you’re new to trading and without any relevant trade history, so set this ratio to 3:1. There are also other important rules, which are part of market strategy. Trade only liquid stocks. stocks have an average daily volume over 300,000 shares traded per day (for swing trade system) or above 1,000,000 shares per day (for day trades). Use only stocks with a price above $5 USD. Stocks with a low price aren’t traded by big institutional traders and therefore are easily manipulated. Technical analysis can fail on such stocks. Also, most big investment funds don’t invest in such low-priced stocks. All money management rules can be easily defined in spreadsheet (like Excel or OpenOffice Calc) and then all values are calculated automatically as you are entering your setup entry, stop-loss and targets. Money and risk management should be key part of business plan for every stock trading strategy used by traders or investors. Every single position should be planned especially from risk management side at the beginning.